Seems like if you want to get faster, you'd just pick up your pace. Sounds like a simple solution, but like many things in life, what seems simple often is not. Many runners have come to the studio saying, "I just can't seem to get past a certain pace. I try to pick it up, but nothing happens or worse, I begin to slow down." To increase pace two things need to happen. 1. Increase VO2Max 2. Build endurance. VO2Max is your body's ability to utilize oxygen at the muscle layer at maximum exertion. Your muscles have a network of tiny blood vessels (capillaries) that carry oxygenated blood to the muscle. If your runs are pretty even and you don't vary your pace too much, your network will be more like sprawling country roads--few and far between. To increase your pace, you need a metropolitan network of highways. Good news is that you can build those new highways of capillaries. How? By doing various types of speed work on a regular basis. Adding one speed workout to your regular weekly running routine will start the construction process. When you consistently add those workouts, your brain will realize that you're not going to stop this. It wants your body to work as efficiently as possible, so your body will actually begin to increase the network of capillaries in your leg muscles to help meet the new energy production demands. The more capillaries you have in your muscles, the more oxygenated blood will reach the muscle. The more oxygenated blood in the muscle, the more potential for energy production. As the network of capillaries grows your body will also increase mitochondria (the energy-making power houses of the muscles.) Mitochondria use the oxygen to create energy. So, now with the increased network of capillaries and increased number of energy-making power-houses, your body will be able to meet the energy demands to get you going faster. It takes commitment, consistency, and hard work to create that metropolitan highway network. It may be tough at first. Expect soreness and fatigue. Anytime you increase the intensity level of your workouts, your body will react. This is called the gain threshold. Your fitness level may even dip for a few weeks. That's when most people give up. They're not seeing results fast enough and they get discouraged. "I feel worse that before I started. Why am I doing this?" But, like I tell my runners, "Trust. Believe. Conquer!" It varies from person to person, but anywhere from 4-6 weeks you'll notice that you're stronger and faster than when you started. The gain threshold is the reason why it's not a good idea to add new intensity just before a big race. You're body will not have time to acclimate and it may hurt your performance. I like having my runners do two types of speed workouts. One type is shorter, but more intense. Intervals are a great example of this. Don't worry, for many interval-based workouts, you don't need a track. The second type is a fast run but incorporated into a longer distance. Progression runs and Tempo runs are great examples. Below is plan to help you ease into adding speed work into your running routine to help you run faster and longer. This is just a suggested plan. You'll need to increase or decrease running days based on your experience as well as your schedule. If you're having to rearrange the runs to better suit your schedule, remember to never pair two hard runs back-to-back. Always follow the Easy/Hard/Easy rule. The workouts listed on the schedules are described at the bottom of this post. Easy Run with 3 Fartleks: "Fartlek" is a Swedish term for "speed play." Take one of your regular weekly 3-6 mile runs and add in 3 bursts of speed. The first week keep the burst of speed at 2-minutes for each fartlek. Remember to space the fartleks out. Do one fartlek in the first third of your run, the one in the second third and then one in the last third. Between fartleks, be sure to slow the pace back down to your original easy pace. 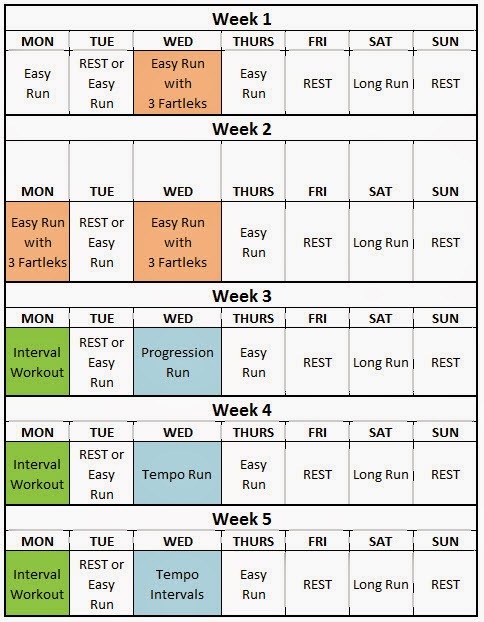 During your second week, try increasing the fartlek duration to 3-4 minutes. That's 13 minutes of fast/slow intervals. Take a 2-3 minute walk or easy jog break, then repeat for a second 13-minutes of fast/slow intervals. Follow-up the workout with an easy 1-mile cooldown. Walk or easy jog for 2-3 mins and then repeat. Follow-up the workout with an easy 1-mile cooldown run. 90s/60s: Do a 1-mile warm-up run. Then run hard 90 seconds /Run Easy 60 seconds. Repeat 5 times. Then walk or do and easy jog 2 mins then repeat the 90/60 workout again. Follow-up the workout with an easy 1-mile cooldown run. Progression Run: "Thirds," involves doing the first third of the run very slow and working into an easy pace, the next third at your regular "in-your-groove" pace, and the final third increases until you're finish the last 3rd around your 10K race pace—roughly 80 to 90 percent of maximum heart rate. Increases in pace are not "step-wise" but gradual. Basically start really slow. Slower than you normally run and gradually increase pace until the end of the last 3rd, you're coming in pretty fast. Tempo Run: Begin with a 1-mile warm-up run and end with a 1-mile cool-down. The miles in between are run at a pace about 30 secs slower than your 10K race pace. Tempo Interval Run: Begin with a 1-mile warm-up run and end with a 1-mile cool-down. For the miles in between, alternate running 5 mins at a pace that's about 30-sec slower than your 5K race pace and 5-mins at an easy pace. Cycle through as many of these fast/slow intervals until you reach your cool-down mile. Keep in mind that during the fast portion of the runs, you should be reaching a pace that's non-converstional. In other words, it should be hard to talk in more than one- or two-word sentences. Be careful not to go so fast that you can't catch your breath or that you can't maintain the interval pace. Initially start conservative with your increased paces and then as you begin to acclimate, start to up the pace. Following this plan for 5 weeks will help you see results in achieving a faster pace and pretty much get you through that gain threshold. Keep at it and you'll continue to see even more progress. This is a great primer for a 5K or 10K race. Start about 12 weeks in advance of the race. If you're not planning on racing any time soon, after the first 5 or six weeks, you can keep just one speed workout or tempo/progression run in your weekly routine until you're ready to kick it up a notch for a race. Do Your Runs Have Purpose?